Dr. Valle completed his medical training at the University of Miami Miller School of Medicine where he was chosen Chief Resident in Internal Medicine. He also completed both a research and clinical Fellowship in Nephrology at the University of Miami Miller School of Medicine where he was honored by being named Chief Administrative Fellow. He is Board Certified in four areas: Internal Medicine, Nephrology, Geriatrics, and Critical Care Medicine and is also certified as a specialist in Hypertension by The American Society of Hypertension. He is a Fellow of the American College of Physicians, a Fellow of the American Society of Chest Physicians, and a Fellow of the American Society of Nephrology. Dr. Valle is in his second term as Chief of Medicine at Holy Cross Hospital. He has also held numerous positions at Holy Cross including Chief of Critical Care and Chief of Credentialing and is also a member of Broward General Medical Center’s Critical Care Committee. He is Medical Director for DaVita’s Peritoneal Dialysis Program at Dixie DaVita. Dr. Valle is the author of numerous articles on Critical Care in peer-reviewed journals as well as co-author of the textbook, “The Liver in Kidney Disease”. His recent article on “Gastric Bypass Surgery in Peritoneal Dialysis Patients” was published in Peritoneal Dialysis International and will soon be published in the “Journal of Obesity”. Special areas of interest for Dr. Valle include refractory hypertension, the diabetic kidney, glomerular diseases, geriatric transplantation, and peritoneal dialysis. He was honored to co-chair the American Society of Nephrology’s Renal Week in conjunction with the University of Miami Miller School of Medicine, Division of Nephrology. He is an Associate Professor of Nephrology at Nova Southeastern University School of Medicine. He is also the Coordinator of the University of Miami Miller School of Medicine Residency Program, Division of Nephrology at Holy Cross Hospital. 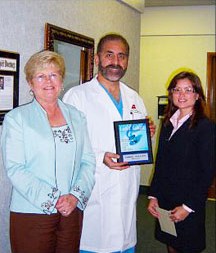 Dr. Valle is chosen as “Top Area Nephrologist” by Gold Coast Magazine annually.. 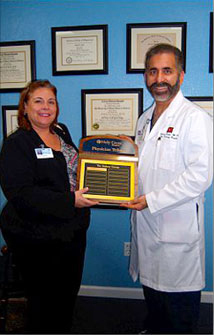 He has received the Castle-Connelly “Top Doctor” honor every year for the past 17 years, both nationally and locally. 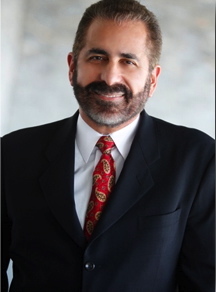 In Florida he is consistently named Top Nephrologist in both Broward and Palm Beach Counties. He was recently recognized as a “Top Doctor” by the New York Times as a top performer in Nephrology’s “Best Doctors” and by U.S. News and World Report as “Top Nephrologist” in both Fort Lauderdale and Boca Raton. Dr. Valle was also chosen to “Best Doctors”, a panel of expert physicians, which affords patients the opportunity to confer via teleconference with the nation’s top medical specialists. Dr. Valle and his wife have three daughters and, in his spare time, he enjoys fishing, baseball, woodworking (ask about his tree house), and his dogs. He is fluent in Spanish and French. and through the independent research of Key Professional Media. in Florida in the practice of Nephrology.